Before I think of ways that makes learners feel my presence while tutoring an online course. I will highlight few important facts about teaching presence that I have recently learned. The community of inquiry model illustrates the overlapping components of teaching and learning in online setting. 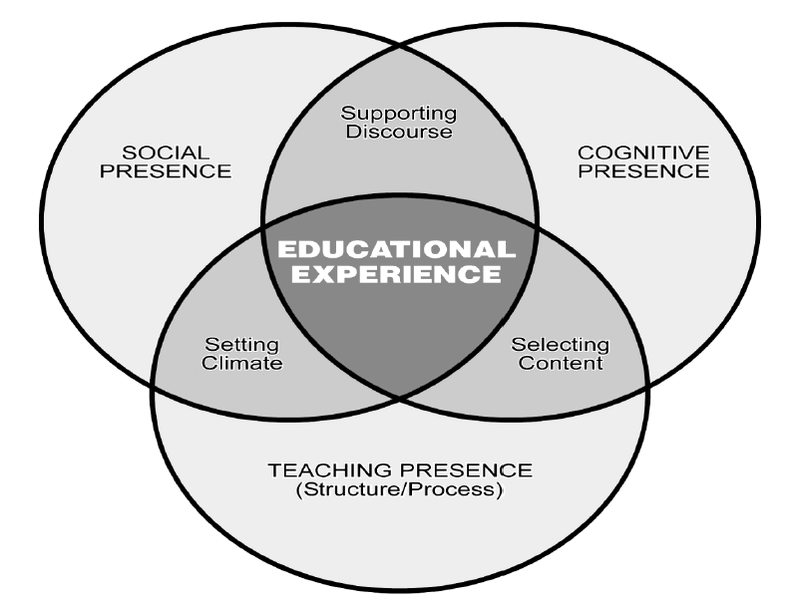 The three elements of this framework are: cognitive presence, social presence and teaching presence as illustrated in the following figure. Teaching presence is defined as “the facilitation and direction of cognitive and social process for the realization of personally meaningful and educationally worthwhile learning outcomes” (Anderson, Rourke, Garrison & Archer, 2001, September). The authors i.e. Anderson et al. have provided three categories of teaching presence: instructional designer, facilitating discourse and direct instruction to overcome the difficulty of conceiving the role of the teacher in online courses (Anderson et al., 2001). One key point to consider is that teaching presence highly impact the development of learning communities for purposeful interaction between students (Shea, Swan, Li, and Pickett , 2005). Start with a well-crafted welcome: This could be done via email before the course begins. Introduce Myself: I can post a profile about myself in the discussion forum or provide a video i.e. a better method that makes learners know me, it can include information about my professional experience and some personal interests that show who I am. It is important that the tone of this introduction to sound informal and genuine. Provide a good orientation: I could create a video to explain course goals, contact information for myself as well as for technical help, remind students to set up their emails, provide my online office hours and let them when to expect replies to their questions / emails, briefly explain course policies and netiquette guidelines, walk them though resources, assignments and submissions. Set a synchronous chat session/call with each student: Using free tools such as Skype or Oovoo, I can have a short conversation 15-20 minutes with each learner to get him/her to introduce him/her self and at same time feel my physical presence. During this call, I will choose conversational tone that makes students feel comfortable to express their concerns after logging and viewing course content. Additionally, I will try to send the message that I am reachable and would support them when needed. Send a weekly message: This could be via e-mail, or a brief audio/ video 3-5 minutes, these weekly appearances can be used recap what my learners completed last week and explain how this week will build upon it. The variety of tools used for the purpose of these touch points enhance engagement and inhibit boredom (Fox Chapel Area School District, 2011, April 7). It is key to consider that the recordings of these weekly messages should sound class-like or synchronous chat sessions, that mean that these recording shouldn’t be a perfect as those we tape for explaining the course content, for instance, if we make a mistake while talking I would just fix it and keep going, it is very important to be conversational. One of the tools I that I would consider using is screencast-O-Matic as it allows to have a mini video of me when screen-casting is needed. Teaching presence implies responsiveness: I will try to reply to students’ comments and questions within the time frame set at the beginning of the course. Provide feedback: There are two forms of feedback to consider. Firstly, informal feedback for instance, providing a general feedback to the entire class on specific assignments or discussions. Another example would be providing a specific informal feedback to certain students, I can send a feedback to those that have been contributing effectively in discussion forums as a mean to award their effective contributions. The other form of feedback is the formal feedback on graded assignments. For constructive feedback I need to recognize strengths and weaknesses as well as suggestions for improvement. Contact struggling students by email or phone: For instance, those who haven ‘t logged in for a while as well as those who have not completed assignments . I will try to find out their reasons and support them in the best possible way. Have a voice in Discussion forums: Forums clearly demonstrate the link between teaching presence and building a learning community. Some key areas to consider involve what to post and how often to participate as an educator in to discussion forums. Dr. Mark Kassel in his video stated that it important to select catchy topics and provide a variety of ways to present them throughout the forum, for instance use an open-ended question, debate, cases, or real-life videos/ documentaries relative to topic and ask learner to post their opinion (Fox Chapel Area School District, 2011, April 7). The Eberly center warned educators “to be careful not to pre-empt the process by jumping in too early” (n.d.). Another good advice is to intervene only if the discussion is ”veering off in the wrong direction” (Eberly center, n.d.). The most effective technique for me to intervene based on learning objectives which means that my involvement will be variant according to the outcome of each discussion (Fox Chapel Area School District, 2011, April 7). For example, in some topics, there is a need for guidance so I might be posting more often, where as for others, I would be monitoring the discussion without intervention and then at the end I can provide a significant summary of learners’ opinions, perhaps share my experience or experts’ points of views on the matter of discussion. One key point that I will consider is that my involvement at early stages of course should be higher than at later stages to encourage learners participation (Fox Chapel Area School District, 2011, April 7). This entry was posted in Online Instruction on January 30, 2018 by Marwa Kotb.